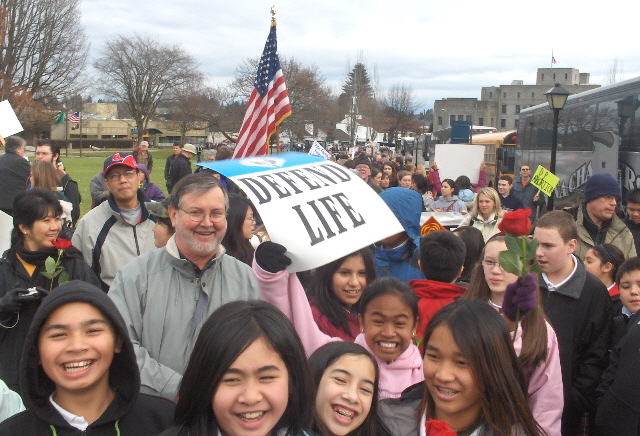 This week our parish middle school participated in the March for Life. 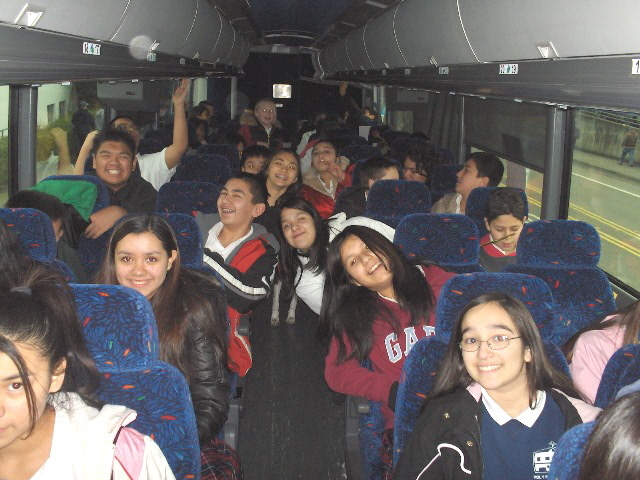 Before saying anything else, I want to thank those who made this event possible - especially our parish Knights of Columbus who paid for the bus and the parents who accompanied us to Olympia and back. 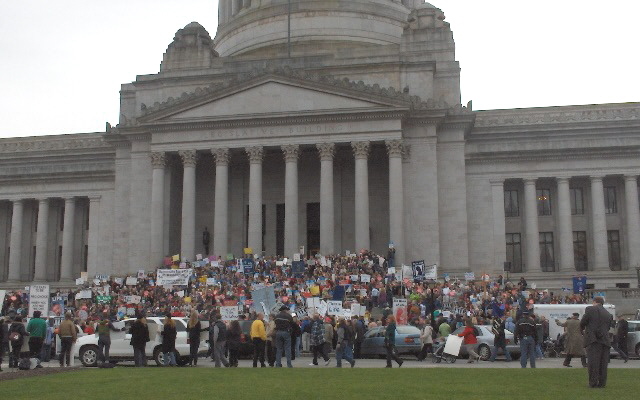 As you are probably aware, the March for Life is the largest annual gathering on the steps of our state capitol. For Holy Family students, this was an opportunity to learn about our state government and to reflect on the central issue facing our society: how we will care for our smallest and most vulnerable brothers and sisters. 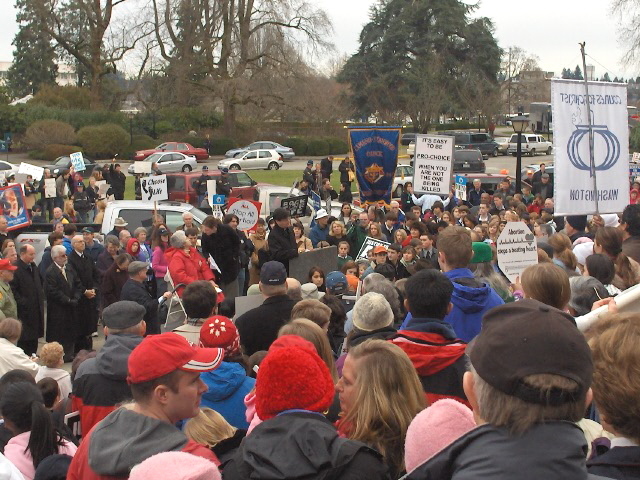 At the March itself, we joined many other groups on the Capitol steps. 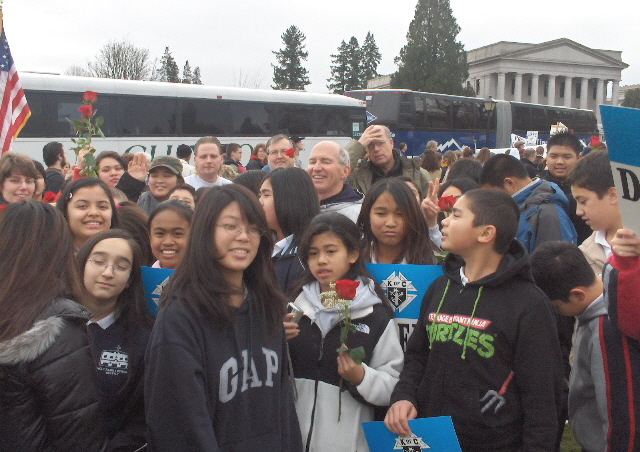 There was a prominent contingent of Democrats for Life, also a group from the University of Washington as well as other local colleges and high schools – and, of course, middle school groups like our own. For about an hour, we listened to legislators speak about various aspects of the pro-life cause. They mentioned an important piece of legislation coming up this year: the Parental Notification Bill. If made into law, it would not prohibit abortion but would require abortionists to notify parents in the case of a girl under 18. We live in an odd world where a health worker cannot give an aspirin to a child without parental consent, but can perform the most drastic surgical procedure without even informing the parents. You will hear more about this bill as the year advances. In addition to the hundreds who gathered on the Capitol steps, there was a small group of counter demonstrators. They kept up a series of loud taunts as the various speakers addressed the crowd. 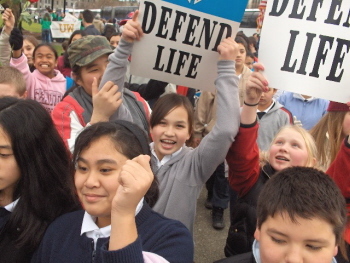 One of their most common taunts is that we only care about children before they are born. That is hardly the case with the Catholic Church (and other Christian bodies). One could mention the great work done by Catholic Community Services, which after the Department of Social and Health Services, is the largest provider of services to the poor in our state. Perhaps even more significant is our Catholic school system. In his column on Catholic schools, Archbishop Brunett focuses on the social impact of our schools. He mentions that each year we educate nearly 23,000 students. If you consider that the per pupil cost in Seattle Public Schools is around ten thousand dollars a year, you can see that we save taxpayers something like $230 million a year. And as Archbishop Brunett points out, in addition to supporting this school system, we are all taxpayers who pay for the costs of public schools as well. Of course, much more important than the social contribution of Catholic schools is our fundamental mission - to bring our children to Christ. In doing the accreditation process, we began with the motto of the Sisters of Providence who staffed Holy Family School for decades. Their motto, taken from 2 Cor. 5:14, states: The Love of Christ Impels Us. That is our starting point and our goal. To celebrate Catholic Schools Week, we will have a variety of activities this weekend and during the week. I would like to highlight two of them. First of all, I ask you to come over to our parish school between 10 a.m. and 1 p.m. this Sunday for the Open House. Our students and teachers have prepared some very informative displays. Secondly, I invite you to the celebration of Grandparents’ Day this Friday. This celebration will include our 8:30 a.m. Mass and a special gathering after the Mass in the Tice Hall. We want to honor our wonderful grandparents, but even if you are not a grandparent, you are cordially invited to participate. Esta semana los alumnos de nuestra escuela parroquial participaron en la anual Marcha Pro-Vida en Olympia. Fue una oportunidad de aprender sobre el gobierno estatal y reflexionar sobre el asunto central de nuestra sociedad: como vamos a cuidar a los miembros más pequeños y más vulnerables, es decir, los niños no nacidos. En nuestra escuela estamos celebrando la Semana de Escuelas Católicas. Les invitamos a participar en la “Casa Abierta” después de la misa de 9:30 a.m. El día viernes habrá el “Día de los Abuelos” con una misa a las 8:30 a.m. y una convivencia en el salón después de la misa. Todos son invitados. El mismo día viernes habrá la misa de la Presentación del Señor a las 7:30 p.m. en español. Esta misa incluirá la bendición de velas. Y no se olviden que este jueves (primer jueves de febrero) el Padre Ramón y yo estaremos disponibles para confesiones desde las 6 p.m. hasta las 8 p.m.